Brigantia, a Romano-British goddess from the north of England, is betrayed by her brother Veteris and tricked into travelling through a one-way time portal to contemporary Britain. While on her quest to seek vengeance on Veteris, she befriends Pravin, a bookish historian who specialises in Celtic paganism. But how far will the sadistic Veteris go to preserve the dominion that he has spent centuries cultivating? Brigantia must adapt quickly to a time that has forgotten her and find a way to break Veteris’ control over the people of Britain, so that she can return to her own time. Ancient myths – I find them fascinating, and in Brigantia we have got a very ancient one, brought to our time! An ancient god of a time of Romans, Celts and myths in the north of England brought to modern day London! That is the elevator pitch, but there is so much more. The links between the characters we have in this first issue. The two gods fighting for a form of control over the humans. One wanting to help and then there is the power! Then we have one of the humans – perhaps the last of the humans who believes in modern times. An excellent idea! As a first issue this had a lot to squeeze in – less so and origin, but how did we get here – the we being the goddess Brigantia. This is fitted into the adventure well, starting us near the end of the beginning and working our way to the end of the new beginning. In between these times, we get further flashes of the past which work out well and add flesh to the bones of the story as we get into it. A well used method for a story which spans so longer a time. I must admit that by the time I got to the end I found myself wanting more! The art is unique too, with some excellent scenes – the panel with the London Underground train was especially good, and really drew my eye. I did find some of the panel transitions hard at some parts, but these were few and far between! There is also some amazing colouring going on here as well, especially some of the more earthy tones. Although not finishing on a true cliffhanger, this first issue gives you the premise, the situation and the problem(s) making you ready for the next issue! 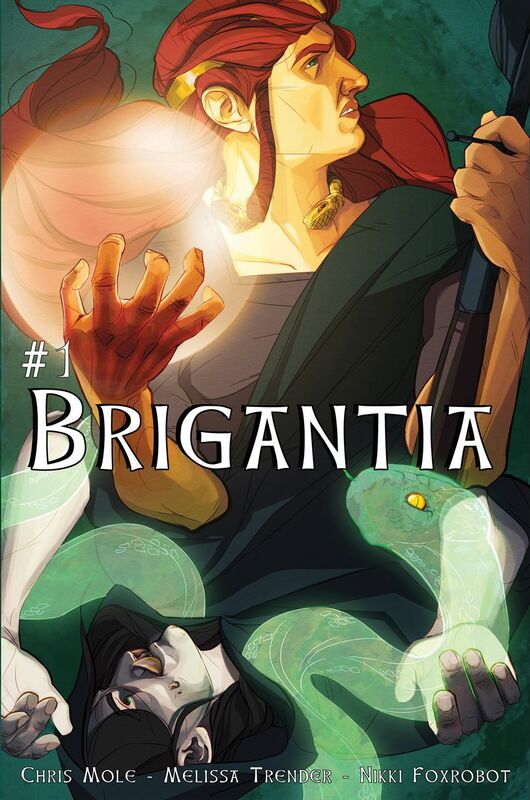 If you want something new and mythic in modern times, check out Brigantia! Chris Mole will also be at Thought Bubble this weekend so you can see him there!